The Philippine National Police on Tuesday identified 75 more areas in its list of election hotspots, bringing to 94 the number of places deemed critical during the May elections this year. In a briefing in Camp Crame, PNP Chief Oscar Albayalde said the dramatic increase in election hotspots reflected the intense political rivalries in these areas. Of the 94 hotspots, Cotabato City and Daraga, Albay were placed under the control of the Commission on Elections (Comelec) as the PNP evaluates what other places might be put in the same category. The Comelec may place an area under its control when there is intense political rivalry between or among candidates, political factions or parties; or paramilitary forces, private armies or identifiable armed bands threaten to disrupt the holding of free, peaceful, honest, orderly and credible elections. The Comelec uses three categories of hotspots―yellow means an area of concern; orange an area of immediate concern; and red, an area of grave concern. Not all red hotspots will be under the Comelec control. 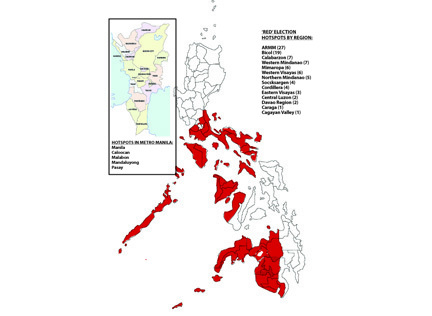 The most number of critical areas were in the Autonomous Region in Muslim Mindanao (ARMM) with 27; followed by Bicol region with 19; Region 4A and Region-9 both with seven; Region 4B and Region-10 with six areas each; Region 10 with five; Cordillera Administrative Region (CAR) and Region-12 with four each; Region 8 with three; Region 3 and Region-11, both with two areas and Region 2 and Region 13 with one each. Earlier, the PNP identified 19 hotspots consisting of Sudipen and Balwan towns in La Union; Jones in Isabela; the municipality of Lemery in Batangas; Roxas town in Oriental Mindoro; Balud and Dimasalang towns in Masbate and Daraga in Albay. It also included Pagadian City and Cagayan de Oro City in the provinces of Zamboanga del Sur and Misamis Oriental, respectively; and the municipalities of Hadji Mohammad Ajul, Lantawan and Tipi-Tipo in Basilan. Also included was the town of Sultan Dumalondong, Basilan; and five municipalities in Maguindanao―Masasapano, Shariff Aguak, Shariff Saydona, Mustapha and Datu Unsay. Western Visayas, 35; Eastern Visayas, 32; Calabarzon with 28; ARMM, 26; Zamboanga Peninsula, 22; Ilocos Region with 24; Soccksargen, 20; Northern Mindanao with 19; Cagayan Valley and CAR having 15 each; Mimaropa, 16; and Central Luzon, 11. With the increase in the number of election hotspots, Albayalde said they will be compelled to realign police personnel to ensure peace and order during the campaign period and the election itself. In Metro Manila, five areas were tagged as election areas of concern in the cities of Mandaluyong, Manila, Caloocan, Malabon and Pasay. More than 14,000 police personnel will be deployed in Metro Manila to secure the campaign of senatorial candidates and party-list groups. Police Office head, Director Guillermo Eleazar said in a statement Tuesday. Eleazar said the start of the campaign period also triggered strict additional rules set by the Comelec. “For the campaign period for local candidates, prohibited acts include appointment or hiring of new employees, creation of new positions, salary increases, and release or disbursement of public funds, among others,” Eleazar said. “[These] restrictions are in addition to certain acts already prohibited during the election period which include the gun ban and use of security personnel or bodyguards by those seeking positions unless authorized by the poll body,” he added. The gun ban is in effect from Jan. 13 to June 12. “We will also increase the frequency of checkpoints in the metropolis to help deter criminal minds in executing their evil designs. I have strict orders to our commanders in the field to observe proper procedures and professionalism when conducting the checkpoints,” Eleazar said. He said the public may report discourteous and abusive police personnel to the nearest police station or at the NCRPO. Eleazar ordered his men to be fair and just in handling cases of political candidates. “Maintain a non-partisan position in handling political cases. Be fair and just, and always side with what is right,” Eleazar said. The Palace urged candidates and members of his Cabinet to follow election laws and help ensure peaceful elections. Presidential Spokesman Salvador Panelo said no government resources would be used to favor administration candidates. Earlier this year, police were looking into the deaths of San Fernando, Cebu Mayor Lakimbini Reluya and Brgy. Bagong Silangan captain Crisell Beltran. The Comelec, meanwhile, warned candidates they could be disqualified if they violate campaign rules. Poll spokesperson James Jimenez said the Comelec has already sent guidelines to all candidates and party-list groups. Under the election rules, posters of candidate should only be two feet by three feet. Posters should only be posted in common areas such as parks and public markets. Jimenez observed many political campaign materials are too big. Posters may be put up in private property but this must have the permission of the owner and the required size of the materials will also have to be observed, he said.